Raising the Bar. 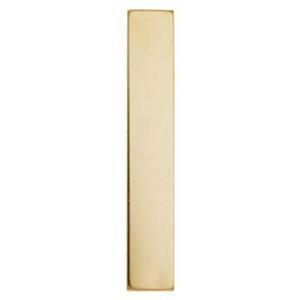 These 14/20 Gold Filled 30.8 X 5.2mm 21 gauge Heavy Bar blanks will help you do just that. Whether you customize them with metal stamps or engrave them, they’ll raise the level of your quality, expectations and jewelry making standards. Notes: Full Hard. Gold filled blanks are stamped or die struck. This type of manufacturing may leave light scratches on the surface. Since this type of scratching is normal it is not considered a product defect. These blanks are great to hand stamp on, they are a nice heavy gauge so they do not ripple from stamping. Nice quality.